Prior to energy deregulation, there was generally only one local provider of energy that handled all generation, transmission and distribution. This worked as the United States grew because it provided stability to the energy infrastructure. However, because there was no competition, the local provider had a monopoly on the industry and were able to set their rates with little backlash. That all changed once energy deregulation was introduced. In a nutshell, Energy Deregulation gives you the ability to shop for the best electricity rates. It separates these three stages of the electricity market: generation, transmission, and distribution. In deregulated states, utilities were forced to sell off their means of production and could only profit from distribution and transmission, since it’s still efficient for one company to handle the physical wires, billing, and maintenance. This opened the door to retail energy providers, who buy wholesale energy from generation companies to sell to the utility’s customers. Customers do not have a choice between utilities, and must still pay transmission and distribution fees to the utility in their respective service areas. However, customers are able to shop around for the actual supply of natural gas or electricity from various retail energy providers. These providers work with the utility to provide the supply, and the actual service is unchanged. In other words, the reliability of one’s electricity or natural gas services remains unchanged, since it is the responsibility of the utility, not the energy provider. When customers don’t shop around, they receive their energy supply from their utility (but they’re missing out on potential savings). 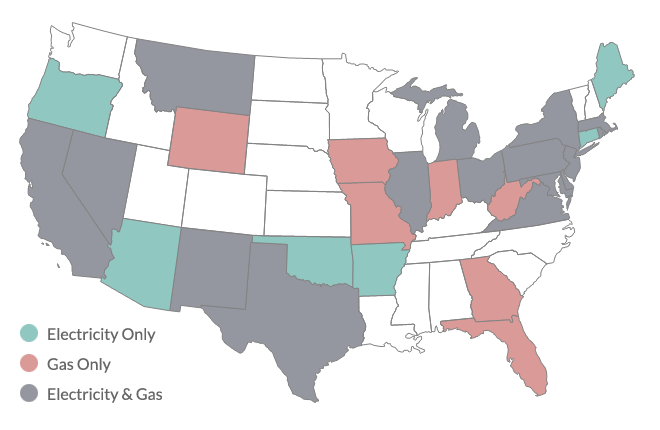 As energy deregulation continues to grow, more and more providers have entered the market in different states. The result is that there is now more price competition than ever before. Residents and businesses of deregulated energy states have more options to compare price and electricity contract details. Energy deregulation, also known as restructuring, resulted from a long string of restructuring of federal policies that eased restrictions on local electricity markets. These began with the Energy Policy Act of 1992 and culminated in two Orders by the Federal Energy Regulatory Commission allowing states to make their own decisions about deregulation. Almost half of the U.S. states responded by taking steps towards deregulation, a process which has had concrete effects in breaking up generation monopolies and increasing effectiveness of delivery. Pennsylvania and Texas have become success stories of deregulation, perhaps in part because they contain their own growing energy industries. Deregulation has opened up space for small- and medium-sized companies to flourish in markets where consumers can actively decide where they want to buy electricity. Pennsylvania in particular has had real successes in reducing electricity prices through competition. Other deregulated markets include Illinois, Michigan, Ohio, Maine, New Hampshire, Massachusetts, Rhode Island, Connecticut, New York, New Jersey, Delaware, Maryland, Oregon, and Washington, D.C.
There’s an open debate about whether deregulation benefits a state’s electricity market. Those arguing in favor believe that the free competition will drive down prices. Critics argue that prices have not been driven down and cite an increase in average rates in some areas. However, most of these critics do not take into account the amount of customers who haven’t participated in energy choice that stems from deregulation and are still paying high prices to their utility for their energy supply. As more customers switch, prices are driven further down because retail energy providers are competing with each other for customers. Deregulation also benefits businesses, which can now negotiate directly with different providers to see which of them can offer a better rate.